From top left: Chambray by J. Crew; The Napsack by Poler; a scene from Moab, photo courtesy of Lanee Lee; and the Wigwam sock that will be your best friend. In the 1974 Sierra Club Totebook: The Best About Backpacking, a small silver manual I picked up in a secondhand shop in California, pages 36-98 are dedicated solely to "Footwear" and "The Outfit" and include a particularly hokey chapter on walking sticks as well as very entertaining drawings detailing the balaclava. If you haven't fully committed to the idea of sleeping in a mummy bag but are okay with a long stroll that leads to a picnic in the woods, then you're ready to get dressed for a day hike. 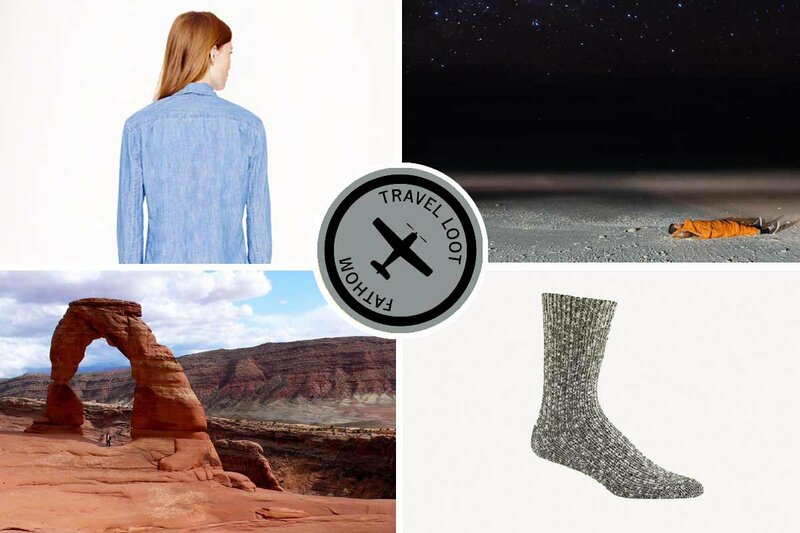 Consider this a starter kit for your hiking wardrobe. Start with a button-up that can be worn over a T-shirt or under a fleece without adding too much bulk. Everyone should have in their denim arsenal. Who wears short shorts? Photo courtesy of Outlier. I love the return to American-made, expertly constructed clothing that has great design and is made to last. for men serve three purposes in one: You can run, swim, or straight-up look good while hiking. Why torture yourself? Hit the trails in a hat unless you want to nurse a sunburn. Popupla contributing editor Stephanie March turned me onto J.J. Hat Center and I have since fallen in love with and . Dry tootsies are happy tootsies. Photo courtesy of Outlier. 4. Wick away the sweat. Oh, how you will thank your lucky stars that you are wearing the right socks. Hiking liners may be all you need in the summer, but a cushy, will keep your feet the right temp in colder climates. for men are soft, breathable, and temperature regulating, too. Cocooning. Photo courtesy of Poler. Whether you're curling up by the campfire or chilling out at the beach, you want to be wrapped in a . Think of it as a high-performance Snuggie for the great outdoors. Keep a around your neck to mop brows, wipe hands, or blow noses in a pinch. Pack an in your pocket. The hydrating, plant-based salve is 100-percet natural and can be swiped on lips, face, and body. Hers and his Vassan versions. Photo courtesy of Penfield. 7. Sing in the rain. Keep dry whether you are sitting pretty or getting dirty with a shell that's strong, soft, breathable, and lightweight, like . 8. Give in to the tread. Do not attempt the Tetons in your Converse. USA-made waterproof and mix nubuck, nylon, and Goretex, ensuring comfort and the traction while trekking sunrise to sunset. Find a seat. Photo courtesy of Yield Design. Pack your picnic in the cleverly designed , which doubles as a blanket. How civilized.